I’m often asked where to go in the UAE for the best hair extensions and I’m often inclined to decline to answer purely because I feel I can not. Ask me the same question in London or LA and I could offer some sound personal recommendations but in the UAE, with seemingly each and every female under the age of 45 sporting some kind of hair extension, whether for volume of length, I’ve been at a loss for suggestions. Of course, most salons say they offer hair extensions (always poa) from their treatment menu but that doesn’t necessarily equal 1) good quality hair and 2) experienced professionals trained in the art of application, and with many different types and brands of hair extensions on offer, searching for a good hairdresser in the region has become somewhat of a minefield. That all changed with my first visit to Salon Ink, a well respected modern salon based in Jumeirah that wouldn’t look out of place in any major European city, all high-ceilings, neutral décor and panoramic windows, its minimalistic sophistication manages to be both edgy and comfortable at the same time. Founded by two highly-qualified Australian stylists, Kelly Cyndrowski and Sharon Anderson, the wealth of talent here as well as their consistently professional, personal approach is a breath of fresh air in a region of inexperience. A wide range of hair and beauty services are on offer from creative styling to colour, spray tanning to nail care but what introduced me to Salon Ink was the fact that they are the only salon in the UAE to offer Easilocks hair extensions. Easilocks have of late, reached cult status amongst celebrities and mere mortals alike for their innovative, no-heat-no-glue system of application that sets them apart from other brands and methods of hair extensions in not damaging the natural hair. Easilocks, available in two methods which we will explore further below, is the only hair extension system available on the market worldwide today that has been carefully designed to preserve the integrity of your natural hair whilst adding volume and length without the need to worry about the long-term effects on your hair underneath and furthermore the hair quality of Easilocks is known to be exceptionable. As an avid fan of hair extensions for quite a few years, mostly for volume as my own already thick, strong hair started to grow less and less due to age and heat damage, I’ve tried just about every brand and method on the market. I found ordinary micro rings inefficient, keratin bonds not ideal for hot, humid climates and clip-ins, well quite inconvenient. So, keen to try out Easilocks I was introduced to Salon Ink and finding a savior in Dubai, I opted to try both the Easi-lock and the Easi-tape method to see what all the fuss was about. Could in just an hour I really be blessed with the hair of a Hollywood star? I visited the salon for a consultation which is imperative in educating your stylist on what you are trying to achieve, for many Barbie beautiful locks are the objective du jour and for others it is simply to enhance what nature gave resulting in fool-proof healthy, hair. Having had keratin bonds for the last 6 months, applied here in Dubai, my hair was in a poor state, although naturally thick, long and dark blonde, I had suffered breakage from continuous straightening and my hair felt wispy and unloved. The stylists at Salon Ink really know (and care) about hair and converse on an international level speaking from years of experience in the industry, something I had previously not experienced since I had moved out to the Middle East. We established that my goal was to add volume to my locks whilst adding a couple of inches of length, I wanted a natural look to enhance my own hair whilst allowing my actual tresses to grow underneath in the best possible condition. Easilocks use only the highest quality 100% human hair which is sourced from around the globe and guarantees the most natural results, blending with each hair type and texture. As my hair is quite heavy and straight, some brands of hair can be too fine and silky to match flawlessly with my own so I was more than intrigued to see how Easilocks would fare. Browsing through a portfolio of celebrities and A-listers that use Easilocks, including Margot Robbie, Alex Gerard and Stephanie Pratt, most of whom you’d never know used them, I felt more than relaxed at the hands of Salon Ink and the Easilocks brand. Now, you can opt for two different types of Easilocks depending on preference; Easi-tapes and Easi-locks. Tapes are a method that is offered in most salons in the UAE and last in the hair for a shorter amount of time than the locks themselves, around 5-6 weeks; however this is balanced by instant length being achieved in around an hour, so you can get red carpet worthy hair in your lunch break. The locks or ‘tips’ as they are commonly referred to, last longer, around 3 months before you can remove and reapply the hair. Being a frequent traveler, the locks seemed like the obvious choice for me meaning less visits to the salon, at first port of call. The locks themselves are applied in a 3 step process once your colour has been matched. I was actually amazed at the colour match with my own hair, which is (with the help of a few high and low lights) a warm, deep honey blonde in an array of shades. Hair is divided into sections and a small section of natural hair is pushed through the easilock itself (a tiny, almost undetectable bit of metal) and then secured into place. The pre bonded human hair extension strand which is thin enough not to put pressure on the hair yet thick enough to make a difference, is placed inside the easilock with the already placed strand of human hair. Then, using an easilock applicator tool the easilock is sealed and locked into place. Voila! No heat or glue involved. This is the completed strand application and this continues for numerous rows depending on your desired volume and length which determines the number of strands used. The end result is phenomenal, yes it takes a few hours to achieve but I was presented with my very own mane of swishy, beautiful hair that was a perfect match with my own colour, having used two different shades of Easilocks. To ensure your hair remains in peak condition is super important when wearing hair extensions and Salon Ink gave me a few top tips to make sure my mane remained magnificent for months to come. Tip 1: Always secure your hair with one hand whilst brushing with the other whilst detangling to avoid putting any pressure or tension on the Easilocks connections with your natural hair. Tip 2: When shampooing your hair work vertically not horizontally or in a circular motion to create fewer tangles. Tip 3: Always use leave in conditioner to the ends of the hair to keep it looking smooth and silky. Tip 4: Gather your hair into a loose side ponytail or plait when sleeping. Tip 5: When swimming always tie your hair into a ponytail or plait and apply conditioner to the hair to act as a barrier against harmful salt water and chlorine. Always shampoo immediately after swimming. Since my Easi-locks application, of which I got months of wear out of them and was frequently complimented on my fabulous mane of hair, I have also tried the tape method, which is a relatively new innovation in the hair industry itself, different from previous weaves and wefts that the early noughties brought us. These are extremely easy to apply and the advantage being that less time in the chair is required. A strong point to note here is that the Easi-tape hair is reusable, as with the locks, so durability might be less than the locks but most, if not all (approximately 80%) of the hair can be re-applied up to a total of 4 times. Hair in thin strips comes pre-bonded with a medical grade adhesive attached which is applied into the hair in rows. Practically undetectable, this method ensures that the hair lies flat and smooth against the head for total camouflage. It was honestly, the quickest, easiest hair extension application that I have experienced and the results were exactly the same exceptional standard as with the locks. We decided to leave these a little longer in length than usual (the hair comes in 18-22 inch) and I was faced with my reflection boasting wavy, summery blonde hair past all the way down my back, such was the result that it drew numerous oohs and aahs from fellow customers. I don’t think there could be a better confidence boaster than Easilocks hair extensions; such is the temptation to swish as you prance out of the salon. Easi-tapes have a few different rules in management and swimming is not recommended with this method of extensions as well as, and a tip I found invaluable, make sure you dry off the roots and the tape area first when drying your hair to ensure that the holding of the agent in the tape has dried completely allowing for maximum strength. The holding agent in the tape is vulnerable when wet so no pressure should be placed on the hair during styling until the roots are dry. Although you can wear your hair up with both methods of Easilocks, it is not recommended with Easi-tape and I found that the extensions were more detectable if I tried to wear my hair in a high-ponytail. This can be rectified so be sure when you are having your consultation with your stylist that if you want to be able to wear your hair up, you make this clear and they can alter the location the placement of hair accordingly. So other than the safer, easier method of application what exactly is the difference? The end result is your answer. These are not your average, detectable “She’s wearing extensions” hair extensions. 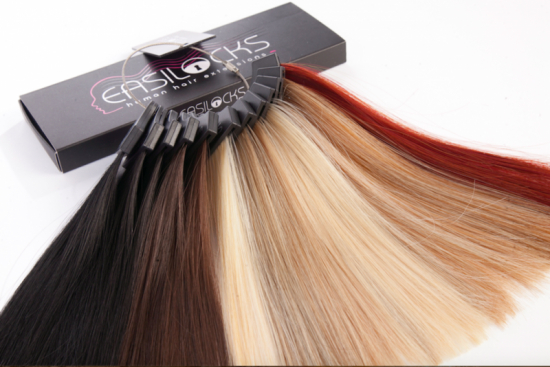 Easilocks use only the highest grade of hair quality; they are treated with gentle procedures and cold water by hand over a period of six days to ensure that the cuticle and hair quality is not compromised. This 100% remi human hair is highly important due to the fact it grows naturally so that all the cuticles are facing the same direction, which is a huge point of difference to many other hair extension brands. To achieve the wide spectrum of colours on offer, organic pigments are used to carefully colour and condition the hair which ensures a long-lasting, multi-tonal effect. This revolutionary new hair can last up to one year if you really look after it. I have to say, I was skeptical for something that had received so much hype, would it live up to my high expectations? I’m pleased to say it did and I am now a devotee myself of Easilocks extensions and still swishing all over the UAE. Open 6 days a week (closed Fridays) Sunday, Monday, Thursday 10-7pm, Tuesday, Wednesday 10-9pm and Saturday 9-6pm. Jumeirah Beach Park Plaza, Dubai.